Sucampo announced its plan to voluntarily discontinue the sale of Rescula (unoprostone isopropyl ophthalmic solution) 0.15% on March 31, 2015. 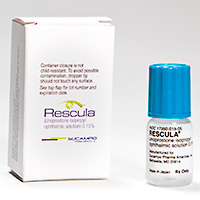 Rescula is a prostanoid currently approved for the reduction of intraocular pressure in open-angle glaucoma or ocular hypertension. The remaining inventory is still available to patients through the American Specialty Pharmacy. Product samples, however, are no longer available and the Route to Savings (RTS) coupon and PA assistance programs have been discontinued as of January 16, 2015. Sucampo stated that the discontinuation of Rescula is not due to any product safety or efficacy reasons. For more information call (855) 737-2852 or visit Rescula.com.